A few more Tree House beers to review including Green which is one of their more common IPAs. This one comes in at 7.6% ABV which is right on the border between a single and double IPA but they classify it as a single. Love the story of how this one got its name, see brewery description below. As with most Tree House beers this one is an unfiltered deep orange with a thick white head. Aroma is full of grapefruit, tangerine, pineapple and just a hint of sweet malts. The first sip is full of fruit flavors but finishes with a nice sweet finish. 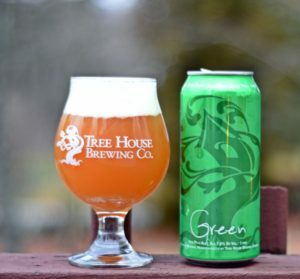 Very little bitterness which seems to be a trademark of Tree House IPAs. No alcohol present, just a superb all around beer. Between this beer and Julius you could drink them with your breakfast and feel like you got daily allotment of vitamin C from your orange juice all while enjoying a beer. I am not advocating beer for breakfast but there are worse ways to start the day. Brewer’s Description: Our cross-continental IPA. Made with Australian and American hops, this citrus heavy IPA opens up in the glass with notes of pineapple, tangerine, and orange rind. It’s sharply bitter and nearly 8% ABV. . . The name comes from the initial batch in which, post boil, the wort looked green from so much hop particulate floating around. Yes. Yes. Yes. Yes.